No more straining to use your device while charging. 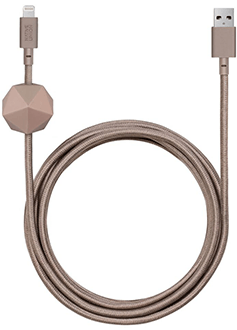 ANCHOR Cable’s brand new construction for 2017 features an ultra-strength reinforced structure that is 6x stronger than standard Lightning cables and has a 10,000+ bend Lifespan. O-Flex Strain Relief Design-controlled flexibility absorbs 2x more stress than regular strain relief. Adjustable, non-slip silicone weight anchors your cable to flat surfaces, while the 6.5-foot range lets you use and charge your device in comfort. Are apps draining your battery quickly? Find out now with TELUS Device Checkup.